The so-called Woodstock of Capitalism has begun. 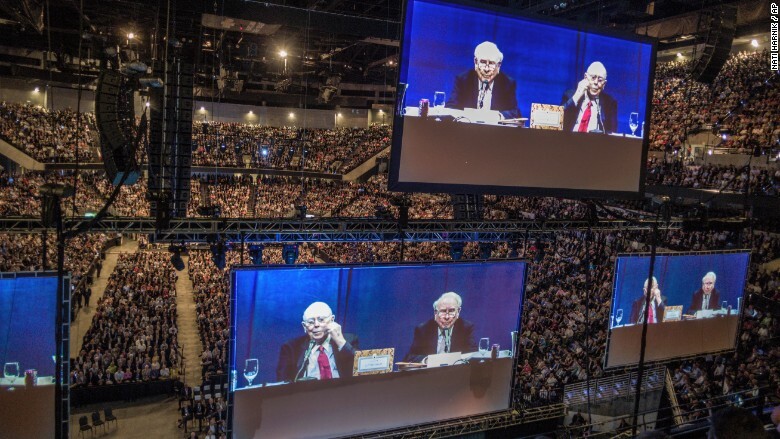 Tens of thousands of people gathered to hear Warren Buffett impart wisdom and answer questions at Berkshire Hathaway's annual shareholders meeting, which kicked off Saturday morning. Thousands more are likely to tune in via Yahoo Finance, which is livestreaming the festivities. There's plenty for Buffett, 86, and right-hand man Charlie Munger, 93, to talk about. Buffett, sitting next to Munger onstage, led with a characteristic quip. 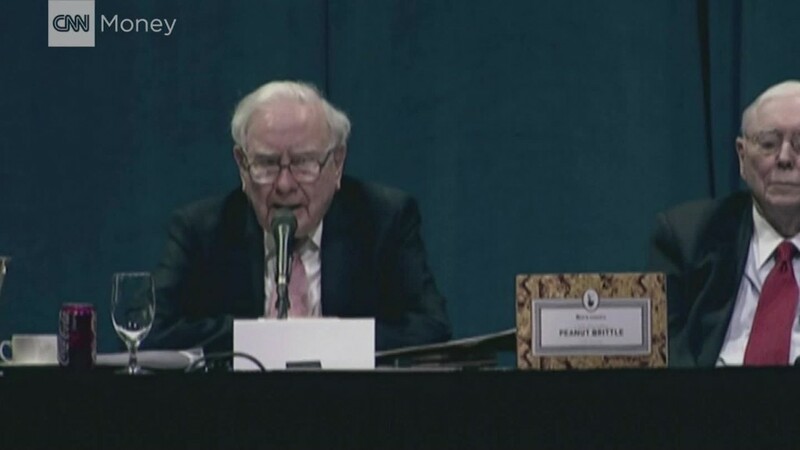 "You can tell us apart because he can hear and I can see ... That's why we work together so well," Buffett said to audience laughter. Other business luminaries are also in attendance. Buffett had Jack Bogle, founder of investment company The Vanguard Group, stand up and wave to the crowd. Bill Gates is there too. 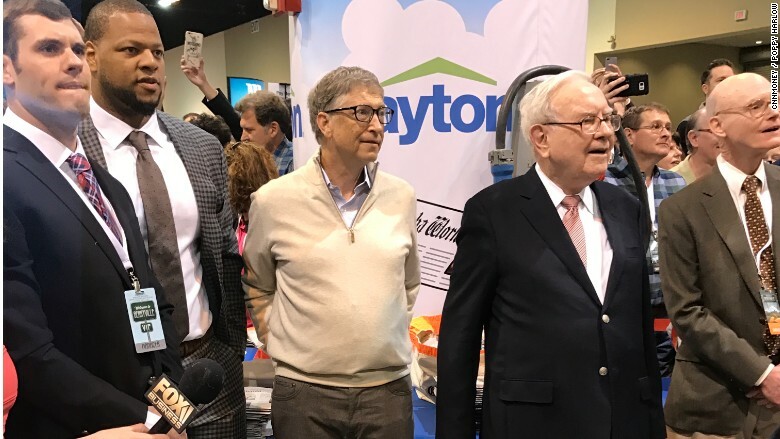 Before the meeting, Buffett cracked open his first Cherry Coke at the Coca-Cola (KO) booth at 7:38 a.m. CT here in Omaha and said: "Ah, it's better than the ads!" Buffett, who is also a huge shareholder of Coke, remarked it was later than when he usually takes his first sip -- which is usually first thing in the morning when he wakes up. He even brought a Cherry Coke onstage with him, while Munger toted a Diet Coke. A massive box of peanut brittle, made by longtime Berkshire holding See's Candies, sat between them. Buffett told CNN that he is currently reading three books and is looking forward to reading "Shattered" about the Clinton campaign. The first question of the meeting was about Wells Fargo, which remains under scrutiny for its fake accounts scandal. Berkshire owns about 473 million shares of Wells Fargo. It's the company's largest holding. "The main problem was that they didn't act when they learned about it. It's bad enough having a bad system, but they didn't act," Buffett said. He criticized the company's incentive system which led to the creation of fake accounts, which he said encouraged "bad behavior." Buffett also faced other questions about business decisions. The billionaire announced earlier this week that Berkshire Hathaway (BRKA)dumped about a third of his IBM (IBM) stock. He's the company's largest shareholder. "I thought it would do much better," Buffett admitted. He maintained that IBM and Apple, which is also a major Berkshire holding, are two different companies. His other major holdings have also attracted a lot of attention recently. The airline industry has come under fire for its treatment of customers. Berkshire has a sizable stake in United (UAL), Delta (DAL), American (AAL) and Southwest (LUV), a move Buffett attributes more to characteristics of the industry than to the merits of any one company. "We're the largest holder of the four largest airlines, and that is much more of an industry thought," Buffett said. Buffett also spoke about the failed Kraft Heinz (KHC) bid for European consumer products giant Unilever. Kraft Heinz is backed by Berkshire and private equity firm 3G Capital. "We would have invested an additional $15 billion, and 3G an additional $15 billion, if a friendly agreement had been reached," Buffett said. That's a lot of capital that remains available for another big deal.